Clockwise from bottom right: Terinu, Gwen, Leeza, Melika, Rufus and Lance. "I hope you're watching this Varn, 'cause you'd better get this through your green ugly skull... You don't own me! Terinu is a black and white, full page Web Comic written by Australian native Peta Hewitt, featuring the title character, an alien boy whose race, the Ferin, were genetically engineered to serve as power sources for the Varn Dominion. Five hundred years ago they were wiped out as the races rebelled against the Dominion's control. Now the Dominion is hunting him down to recover their source of power and take the galaxy back, the space pirate who raised him wants to hunt him down to use him as her personal assassin and the Galactic Sapiens Alliance wants him either dead or dissected. An intricately plotted and well drawn and written comic series, set in six chapter arcs in a standard comic book format, mimicking the original dead tree editions. Terinu: Our Hero, a fifteen year-old alien boy with an understandably touchy temper and severe trust issues after being abused half his life. Leeza Blake: A civilian starship engineer and daughter of the Fleet Admiral Erwin Blake. Her mom was Stuffed in The Fridge sometime before the story began. Currently she's Terinu's legal guardian. Unknown, even to her, is that she's Terinu's "Master"
Ru Ofanius "Rufus" Brushtail: A vulpine star fighter pilot/mercenary/hidden noble. In other words a born swashbuckler. Gwendolyn Freeman: Leeza's fifteen year old cousin and a cyberglider. Bounces between being irritated at Terinu and worrying for his safety. Matt Townsend: Terinu's best friend and possibly his lover, if you believe the fans in the universe. Lance Freeman: A Space Marine demolitions expert and cousin to Leeza and Gwen. Tended to bump heads with Terinu at first, but has since mellowed towards the boy. Melika Softpaw: Terinu's foster mother and his fiercest protector after Matt. The Varn Gene Mage: Eight foot tall, green skinned, horned creator of Terinu's race. Tends to be Affably Evil when he isn't directly threatened. General Oryon Gisko: Leader of the Galapados Warriors, a genetically engineered race created by the Gene Mage to match human aggressiveness. A nice iguana when he's not on the job. Lady Mavra Chan: Self-styled Space Pirate noble, with an emphasis on the "Pirate" over the "Noble". A Complete Monster. "Brutal" Brooks: Chan's second-in-command with all of her bad traits and none of her limited charm. Princess Titalia: An Ardactavian (read: bug race) princess, currently plotting the overthrow of her mother, using Gwen as her pawn. Admiral Erwin Blake: Chief of the United Systems Alliance fleet and determined to hunt down and kill Terinu to preserve the Alliance's safety. This makes for rather awkward relations with his daughter Leeza especially after he tossed her in jail. Affably Evil: The Gene Mage. All There in the Manual: It's not actually required to understand the comic, but a run through the site's Almanac helps explain some of the universe's politics that underlie the characters' actions. When tens of thousands of Vulpine are at risk from a deadly virus, we only really see the first two victims, Rufus and Melika. However, when the Human Federation's genocide of the Ferin is revealed, Leeza is properly horrified. It doesn't hurt that when she makes the discovery, we see an obscured autopsy photo of one of the victims. Badass: Rufus, being the Ace Pilot. Subverted slightly in that he readily admits Melika is a better pilot. Bare Your Midriff: Gwen is particularly guilty of this, though pretty much every female in the main cast shows a little belly in the gallery pics. Batman Can Breathe in Space: And so can Teri thanks to his race's rather extreme modifications courtesy of the Varn Gene Mage. Well, not exactly breathe, but survive for a long time. Belligerent Sexual Tension: Teri and Gwen fit this to a T.
Berserk Button: Don't ever call Terinu a pirate, or insult Rufus' beloved starfighter. Big Bad: The Varn Gene Mage. Calling the Old Man Out: Leeza did this after discovering what happened to Terinu's race. It ended badly. Cast of Snowflakes: Practically every character with the exception of Galapados mooks is unique in some way. Child Soldiers: Terinu was trained from the age of nine to be an assassin by Mavra Chan. His best friend Matt was sold at age eleven by his own father to the same pirate to serve aboard her ship. Crapsack World: The supposed good guys' government practices indentured servitude of criminals, selling them to biological research companies as test subjects, space pirates run rampant through the universe and Terinu's best bet for safety is with the Big Bad. Dark and Troubled Past: Terinu has this one in spades. Being the last member of your race and raised by a psychotic space pirate will do that to you. Dude in Distress: Terinu, frequently, given his status as both the hero and the MacGuffin. Does Not Like Shoes: Terinu especially, given the structure of his feet, but Ninetta has no excuse. The Dragon: The Gene Mage has Gisko, and Mavra Chan has her first officer "Brutal" Brooks. Everyone Is Bisexual: Or at least all the ferin are. It's part of their design. Fantastic Caste System: The Vulpine skirt this, dividing themselves into Farmer Lord (the Rulers), Military (the Fighters) and Commoner (everybody else). Fortunately there's some give to the system, with Commoners able to marry up into the Farmer Lord class, usually by gaining recognition during their mandantory military service. Fan Disservice: Seeing Gwen in her Fetish Fuel exotic dancer outfit, in front of two very tall aliens who make her look ten instead of fifteen years old. Fan Service: Terinu getting naked or half-naked (usually against his will), shirtless furries and Gwen in her Exotic Dancer Barbie costume (but see above). Not to mention the December 2008 calandar image, with all the girls in bikinis on the beach (in the Land Down Under). Genocide Backfire: The reson why Terinu is still around, possibly combined with Hidden Elf Village. Gentleman Adventurer: Viscount Ru-Ofanius "Rufus" Brushtail, a Vulpine (anthro fox) Ace Pilot who slums as a mercenary just for fun. Happily Adopted: Terinu by Melika, at least until Mavra Chan tore him away from her. Happiness in Slavery: The Ferin were gene-gineered to be happy servitors to the Varn. Has Two Mommies: Four really. His biological mother whomever she may be, Mavra Chan, Melika and Leeza. The latter two are the only ones likely to cooperate raising him though. Heterosexual Life Partners: Teri and Matt spent half their lives as the abused slaves of a insane pirate warlord, with Matt stealing food to keep Terinu healthy and at one point cuddling with him in bed after Teri's powers were traumatically activated. Word of God has stated "They'd both rather be dead than see the other hurt." Humans Are the Real Monsters: Especially after committing genocide against the Ferin and then trying hunt Terinu down to finish the job. Humans Are Special: At least five other races spent over a thousand years as slaves of the Varn Dominion, but after trying to conquer humanity the Dominion fell in less than a hundred years. If It's You It's Okay: Matt for Terinu according to the Word of Gay. 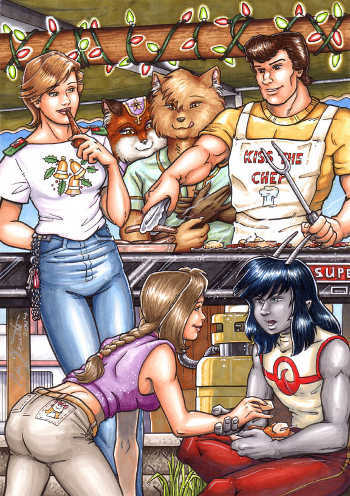 Interspecies Romance: Terinu is falling for Gwen, a human girl his own age and possibly Matt in the past. In a canon text story by Peta, a human girl also apparently has a long running affair and eventually becomes engaged to a vulpine. It Got Worse: Text stories set a hundred years in the story's future have the ferin race rediscovered and integrated into Vulpine society, with Terinu as their leader but he's desperately lonely and there are uncounted thousands of ferin living as slaves, being considered non-sentient pets outside Vulpine space. Jerk with a Heart of Gold: Depending on the circumstances, either Terinu himself or his nemesis Lance. Made a Slave: Teri's childhood friend, Matt, who was indentured to Mavra Chan when he was eight to pay for his father's drinking induced debts. It says something about how sucktacular his family's life was that this was an improvement. Mama Bear: His foster mother, Melika, a Vulpine female who took responsibility for raising him as a baby, having just met him less than five minutes before, just because she thought it was right. Later she helps steal a fighter and stage a jail break to help rescue him. Never Learned to Read: The Gene Mage never corrected the Ferin's built in dyslexia when he uplifted them, as a security measure when they served the Dominion. People Jars: Happens a lot, between Ferin power cells, Galapados gestation tubes and Princess Titalia's non-sentient breeding clones. Powered by a Forsaken Child: Terinu's entire race was genetically engineered for this purpose, and to enjoy it. Proud Warrior Race Guy: General Gisko, leader of the Galapagos, who even in defeat is respectful of his enemies. Punch Clock Villain: Gisko again, given his upset about being called away while his wife is pregnant. Reptiles Are Abhorrent: Played straight initially, until we see Gisko in private with his beloved god and even more beloved wife. Scary Dogmatic Aliens: That would be the Varn, yes. Servant Race: Terinu's reason for existence. The Ferin were designed to serve the Varn as a genetically "pure" race of servants. Shout-Out: Mavra Chan is named for Mavra Chang, a mercenary and pirate from Jack Chalker's Well World series. Slave Race: Everyone who served the Varn Dominion, except the Varn themselves. Son of a Whore: Terinu, in the "Raised in a whorehouse" variety. Except it was a cabaret. A really high class cabaret. Space Pirates: Mavra Chan is definitely one, albeit of modern Somali type rather than the more romantic Yo-Ho-Ho sort. Stalker with a Crush: The Gene Mage arguably, in regards to Terinu's whole race. Then again he did design them. There Are No Therapists: Despite a nightmarishly abusive childhood bearing obvious consesquences on his psyche, no one has taken Teri into therapy yet (not that they've really had time). Throwing Your Sword Always Works: A rare villainous example, when Mavra Chan spears Leeza. Training from Hell: What most of Terinu's time with Mavra Chan consisted of. Uncle Pennybags: Rufus, who at one point pays off a debt Melika had been laboring to get rid of for ten years. Wave Motion Gun: Subverted in the first story arc, as the weapon belongs to the Dominion and used by the Varn Gene Mage to test Terinu's abilities and crack open a Creo asteroid colony. It's implied that they once had even bigger cannon, used to bombard the Earth when they invaded it 500 years ago. Wham! Episode: When Leeza confronts her father about the secret that Humanity committed genocide against the Ferin. We Will Use Manual Labor in the Future: With indentured criminals no less. Would Hurt a Child: Mavra and Brutal Brooks, most definitely. This page was last edited on 11 April 2017, at 12:55.